One of the better known examples of a “born-again poster” as it were, turned out to be one of the most celebrated Razzia has ever created – his acclaimed “Pasta” poster. It was relatively early in his career. With an important French pasta company in mind, Razzia created a bold image of pasta as a symbol; the pasta symbol. 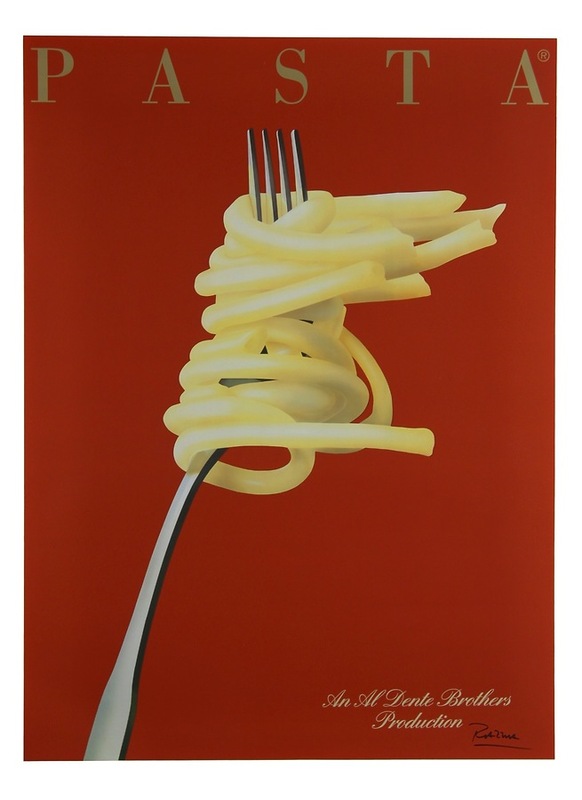 Showing pasta on a fork against a red background, the image had an immediacy that conveys the message of pasta being a food that everybody eats and loves. Confident in the power of the image, he contacted the French company. Unfortunately (for them), the company never agreed to meet Razzia to look at the work. Slightly annoyed, Razzia took it upon himself to publish it himself. The image and the type worked and the poster was an immediate success. That was back in 1986. Now it's probably one of the best-known posters in the world. “Pasta” is proudly displayed in private settings as well as in many a restaurant. The poster has also been used on the set of “Friends,” the famous American television series.